As we know, Golden Crown is one of the best and most expensive Thai Socotranums. It will be better if we can make it more beautiful from the beginning. 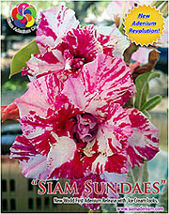 First, we have to choose the 4-month seedlings originally from original hybrid Thai Socotranum: Golden Crown. We notice and select the seedlings with caudex balancing with top branches. Branches should be balance in 4 sides or in the same level and also has main middle branch the most important for this Golden Crown. The root’s consideration in this time is pretty hard because it’s in media. Next, we will repot these selecting seedlings in new media mostly we start doing this with 2-2.5 inch caudex seedling. We also need to organize the roots at the same time; this should be planning to do in young seedling because it will be easier than doing all in pretty old seedlings. Root in good characters should be beautiful when it’s growing up and grow spread around the caudex. About 60% of Golden Crown can provide nice spread root by nature. Personally I prefer to organize root grown by nature than root cut by human. I stretch the roots out and make 80 degree distantly from caudex. Make the media like mountain shape and press around media. “The tight media from mountain shape will help or control root to grow spread in sideways only, not go down to bottom pot”. Cover the roots with media around 1.5 inch height. After 3 months, root will be bigger and spread around caudex like centipede which we can organize this root now. The important thing is not to take seedling out before 3 months because root is not strong and too small, this could make root cut off. symmetrically. The most important factor to help this is “Sun Light” direction. We will spin the pot and let the short or missing branches to hit with the sunlight fully to make them growing equally with others. Using the sunlight technique should do with young seedlings but hard to do on elderly ones because they will be easily adjusting themselves. How can we do the branches for elderly seedlings? I will share the idea next time. I hope this help.. Have a nice day.